Capture the moment with Josh, Emily, Haju, and your fellow patrons this week as we explore demo discs, choice limitations, and the unique impact of audiovisuals. Listen in as Josh creates the frameworks for a video game and anime, Emily speaks in code to one particular patron, and both hosts describe one of the most beautiful gifts they've ever seen. 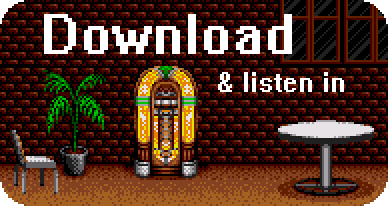 On your way out, don't forget to drop in on our new Patrons of the VGM Jukebox Facebook group and the also-new VGM Podcast Fans group! Ever wish there were five of you? Josh and Emily do, and they're already locking in what each clone's specialization would be. Jump in, ponder along, and also consider the effect of memories on musical enjoyment, the dual destinies of Josh and Jake Kaufman, Aretha Franklin's vocals, and tiny 8-bit worlds that go on forever. There's also a bit of a shakeup in Josh and Emily's usual overworld adventures. How permanent is it, and what will it mean for our intrepid heroes? Only time -- and perfectly roasted marshmallows -- will tell. Also, don't forget to stop in on our new Facebook group! This week is all about commotions as our patrons send us actual physical mail, describe their first VGM ruckuses, and have their testimonials spontaneously transformed into film noir dialog. As a bonus, learn the best way to conjure Emily's spirit after death, and hear about Josh's continued Pokémon Go adventures in life. So hop on an airship, blast this podcast, and create a solo moshpit so crazy it gets your whole family's attention. A little over a month ago Josh and Emily fulfilled their Patreon promise of streaming their suppers together on Twitch -- and, of course, they listened to some excellent VGM along the way. Although the audio situation in the livestream itself was a bit garbled, now you can relive the magical dinnertime experience (or create your very own) with this special release of their Mukbang Mix! This mixtape is exactly what they were listening to as Josh powered through his Del Taco buffet and Emily showcased her childhood gaming memorabilia. Enjoy digesting these tasty food-related jams in their pure form!